For over 15 years now we have been providing background music at a number of high profile events, ranging from a small gathering of just 4 company directors dining in style on board a yacht, through to a black-tie dinner for 150 employees in recognition of excellent work, hosted in the grounds of a castle. Whilst such gatherings may vary slightly in style and theme, accompanying background music will almost always be a requirement. 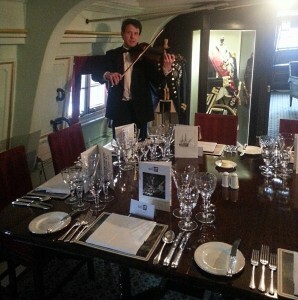 Our string quartet dressed in dinner jackets and black bow-tie, is a popular choice amongst our clients, performing music during the arrival meet and greet drinks, continuing throughout dinner up until the speeches. For smaller gatherings, our cocktail pianist or solo violinist may be more appropriate.